Air conditioning, heating and ventilation systems should be operating -The temperature and relative humidity be at "normal living conditions"- that is between 60 & 80 degrees (F) and between 30-50 percent humidity- for a LEAST 6 days prior to the wood flooring being delivered. The wood floor should then acclimate to conditions at the jobsite for 3 to 5 days. Moisture testing should be the responsibility of the wood floor and/or general contractor. Furniture, appliances, room furnishing, and old floor coverings should be removed from rooms where flooring is being installed. -Plastic should be used to help seal off the work area -There will be sawing, hammering and other noise during installation -Make sure you understand the time frame involved & the duration of installation. -Finishing should take place 5 -7 days after installation (unfinished)-you can walk on the floor during acclimation (before sanding & finishing) - Prefinished floors should have at least 72 hours before heavy foot traffic. -Make sure you go over the work schedule with the wood floor contractor, know the number of days it will take, when the floor can handle foot traffic, always allow scheduled work to be completed as specified. This will ensure a good job & the best results possible. Make sure the floor is protected and/or measures are taken so that other trades and/or people coming in after the wood floors are finished. There is nothing more frustrating than some one else not using due care & causing a good job go bad. 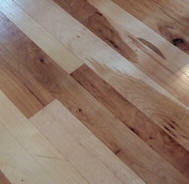 Things you SHOULD NOT expect from a wood floor finish ! 1. A table top finish. Each piece of oak flooring sands differently depending on its grain type (plain or quartered) making it virtually impossible for a completely flat surface. 2. Dust-free finish. Since your floor is being finished in your home it is not possible to achieve a "clean room" environment. Some dust will fall onto the freshly applied top finish. 3. A monochromatic floor. Wood, as a natural product, varies from piece to piece. Remember it is not fabricated -- it is milled from a tree and will have grain and color variations consistent with the grade and species of flooring selected. 4. A floor that will not indent. In spite of the term "hardwood", Oak flooring will indent under high heel traffic (especially heels in disrepair). The finish that is applied will not prevent the dents. 5. A floor without cracks between the boards, or within the parquet pieces. Although your new floor may start tight together, as a natural product it will continue to absorb and release moisture. This natural process will cause the flooring to expand and contract from season to season -- resulting in cracks between some of the pieces in your floor. Some stain colors, such as white, will show this process more than others. Understand that furniture, cabinetry, doors, etc., are fabricated in a factory under ideal conditions and that they contain 1-10 different pieces of wood. Their floor is fabricated in their own home and is made up of 300 to a thousand individually different pieces. And that their floor is never to be duplicated -- a truly custom floor of their own ! After the job is completed, go over the job with the estimator and/or job supervisor. Maintenance procedures should be reviewed, along with proper protection of furniture (place protection under legs) before it is placed onto the new wood floor and items of concern should be addressed. 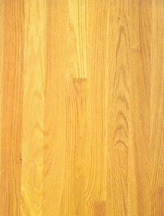 Remember, wood floors are an investment, proper maintenance will give you years of beauty & enjoyment !